This small park has an incredible list of bird species despite being surrounded by coastal development. It illustrates how important a small maritime hammock is for resident and migratory birds. Fallouts can occur in April and day lists of 15+ warbler species are possible; overall, 32 species of wood-warbler have been recorded at the park! Rare warblers like Cerulean, Nashville, Connecticut and Wilson’s have all been found by local birders. Spring is also a good time to search for other songbird migrants such as Painted Bunting, Great Crested Flycatcher, Rose-breasted Grosbeak and Scarlet Tanager. 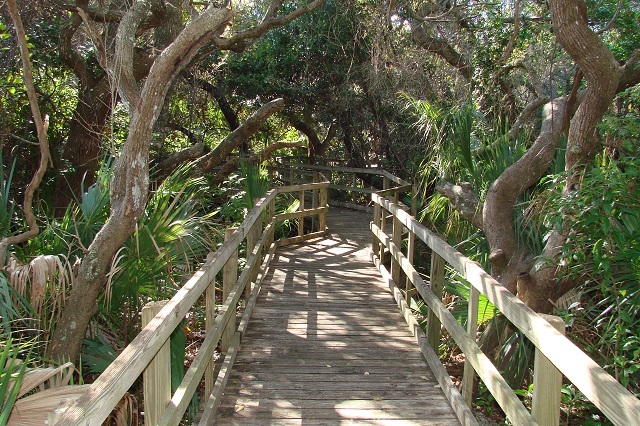 Access the 0.6-mile interpretive boardwalk from the north parking lot, or via the paved walkway from the south parking lot. Multiple dune crossovers lead to the beach, where Laughing Gulls, Royal Terns and Black Skimmers are regularly encountered; Glaucous and Lesser Black-backed Gull have been spotted on the beach and Black Terns can be found in August. In the summer, look up and offshore for Magnificent Frigatebirds and for raptors like Merlin in late fall and winter. Sadly, the park’s coastal scrub no longer supports Florida Scrub-Jays, but check for other landbirds including White-eyed Vireo and Gray Catbird.